Thank you for your interest in my landscape design services! 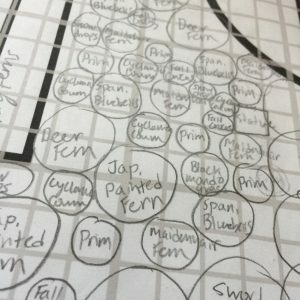 My design process is not just about the plants. It is an interactive and educational experience intended to mentor you through the creation of the landscape of your dreams. Design is just one element in creating a low maintenance, healthy and beautiful landscape. Of course, this is not everything that needs to be taken into consideration when you put in a landscape. However, without these basic elements, you are setting yourself up for extra maintenance (or even failure) right from the start. Other, important and more-specific elements will surely be considered, depending on your space (for example: erosion control, pest/disease prevention, etc.). Using science-backed information and personal experience, I can coach you through these elements to help you achieve the landscape of your dreams. –I design flexibly. I can work in any style, and any space! Designs can be as simple & general, or as complex & detailed as you please. Just let me know how I can best be of service. Design maps can be a quick pencil sketch, a beautiful black and white printed plan, a full color map, or a 3-Dimensional interactive landscape. –I can coach you through the elements of a successful landscape. Whether you are installing a landscape yourself, or hiring someone else to prepare and plant it, you will need to understand what is important to create the healthy, low-maintenance, and beautiful landscape of your dreams. -I can teach you hands-on gardening skills. Need help with pruning? Garden care? Dahlia dividing? Seed starting? Apple tree grafting? Have me out for what is essentially your very own one-on-one gardening workshop. Some have me out for multiple sessions at different times of the year to teach proper garden maintenance. Let me know what you are looking for! –I include you in the process! Some design projects I will take home and complete based on the needs and wants you have expressed to me. Alternatively, designs be completed collaboratively. Depending on how hands-on you want to be, sometimes having your insight and approval combined with my plant and design knowledge in collaboration is more efficient than when I work behind the scenes. This is up to you! To do this, all I need is a table, your time and enthusiasm, and an internet connection. Some of my largest and most complex designs have been created in collaboration with my clients over multiple sessions. -Optionally, you can have me source the plants for your design. I charge a delivery fee for this service but can save you a lot of time plant hunting! I can alternatively make shopping and nursery recommendations. –I don’t make detailed irrigation recommendations. You will need a certified irrigation specialist for that. –I don’t install the landscape. You can hire an installation company or do-it-yourself. I can, however, coach you through the best way do-it-yourself! I can even come out and provide one-on-one and hands-on tutoring as you install the landscape. –I don’t have outside companies that I recommend for services, as I do not like to endorse others’ work besides my own. I do recommend having multiple companies out and comparing bids. Here is a list of landscaping companies in the industry who have gone out of their way to be members of the Washington State Landscaping Association (select Clark County on the map to see a specific list). Here is another link to landscapers of Clark County, WA. You can check out this list as a starting point for irrigation specialists as it provides contact information on those that are properly certified. The City of Vancouver provides many resources regarding hiring professional tree care providers and arborists. Check out the multiple lists of certified professionals on this webpage. –My recommendations are not meant to replace recommendations, assistance, or consultation from certified third party (engineer, architect, mason, irrigation specialist, hardscaper, contractor, arborist, soil scientist, utility inspector, etc.). A design by me will provide aesthetic suggestions for the installation of plants and particular amenities, but does not seek to replace the certified approval of such professionals. The typical design process includes an initial consultation. 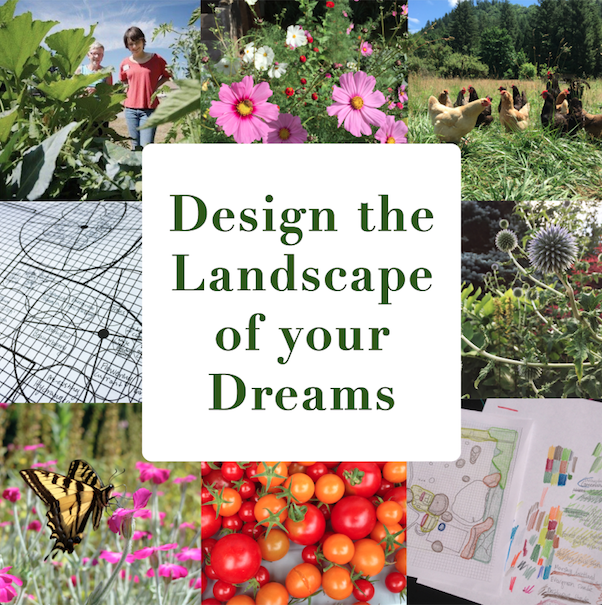 We walk around and talk about your dreams and goals for certain parts of your yard, answer any questions you may have, and determine which of my design offerings and resources are best for you. I provide an estimate of the cost to create the type of design you desire. Often, on this same day of our initial meeting, I take the needed measurements and get started on your design right away. There are two ways the design process can go from here. One option is for me to go home and complete the agreed upon design work, then follow up with a meeting where we review the design. Some design clients like to go over things, love the design, and feel ready to go at this point. Others like to make slight alterations and customizations, and meet up many times to consider multiple creative possibilities until the design is finalized to their liking. The second option is for us to design together. Depending on how hands-on you want to be, sometimes having your insight and approval combined with my plant and design knowledge in collaboration is more efficient than when I work behind the scenes. This is up to you! To do this, all I need is a table, your time and enthusiasm, and an internet connection. Some of my largest and most complex designs have been created in collaboration with my clients over multiple sessions. During a final meeting, the completed design materials are presented along with any additional needed information or resources. This is how things typically work, but it is a very flexible process. I bill by the hour so I can offer such flexible services to meet your needs. 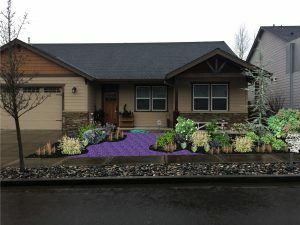 *Learn more about my background here, which includes an OSU Certification for Permaculture Design, a Certification to Create and Administrate School Gardens through Growing Gardens (organization in Portland, OR) and a Certification through WSU Extension to Create and Mentor in Community Gardens. There many variations of design amenities that I offer. Desired amenities are often determined at an initial consultation, based on the scale of the landscape and your needs. Based on a desired theme, style, or aesthetic, a garden-scale landscape design is plant-focused and lays out the plans for a future garden. Mature plant size, bloom and foliage color, winter interest, irrigation, use, style and similar considerations are taken in the design process. Most designs are printed on a sheet of paper that is somewhere between 18×18 inches to 36×36 inches, depending on the size and scale of the design area and detail of the landscape. Small designs are sometimes printed on letter-sized (8.5×11 inch) paper. There are three options for this map. 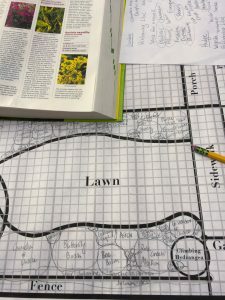 The most popular option is one I call “Adjustable.” The base map and to-scale grid is created graphically and printed in black and white, and the plant recommendations are added to this map in pencil. The primary benefit of the pencil design is that it is adaptable. If one is installing the design and a quick plant substitution needs to be made, the map can be easily updated and thus remain an accurate representation of the landscape. A “Black and White” map costs slightly more than the “Adjustable” one. A “Black and White” map is created entirely graphically, and printed in ink. A “Full Color” map is also available at a slightly higher cost. Here are some examples of pencil plant placement maps. Note that pre-existing structures and plants, main walkways, and a grid overlay are graphically created as a map foundation. Plants are then added in pencil. Do you already have some gardening experience, but just want to know what to plant, where? A “not-to-scale sketch” is a great way to receive a quick design recommendation for a small area. Just like a to-scale design, it is based on a desired theme, style, or aesthetic. It is plant-focused and lays out the plans for a future garden. Mature plant size, bloom and foliage color, winter interest, irrigation, use, style and similar considerations are taken in the design process. These are typically done on letter-sized (8.5×11 inch) paper, and entirely in pencil or a mixture of pencil and pen. Imagine being guided through a tacky 3-D computer generated representation of your finished design! Birds chirping, sun shining, water features bubbling, and more. 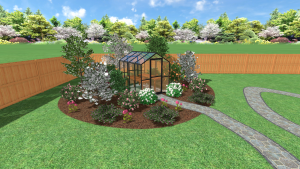 I can create a part, or all, of your landscaping project in a 3-D design program. Through this program we can navigate your landscape, from small gardens, to entire yards. The purpose is to help us visualize the finished project once the plants are at maturity and everything is in place. This can be incredibly helpful! After all, you want the best possible understanding of the finished product before investing in your new landscape. Three dimensional designs can also be quickly edited and adjusted on the spot, so modifications can be made as we are together during a consultation. This computer program starts with an uploaded photograph of your current landscape. From there, plants, garden art, rocks, ponds and more can be dragged and dropped onto the picture. This is a quick and effective way of providing a graphic visualization of a design. This can be incredibly helpful! After all, you want the best possible understanding of the finished product before investing in your new landscape. Two dimensional designs can also be quickly edited and adjusted on the spot, so modifications can be made as we are together during a consultation. For entire yards or properties with big renovation plans. This package is customizable and adaptable for every property, and billed at periodic intervals. Properties that benefit are ones that plan to incorporate multiple new gardens, features, living spaces and more. A property-scale design is more of a process than the other design services. Typically, you would start out with a 3-D Interactive Imaging design of your entire property. During the initial consultation, I would take the measurements needed to make the 3D map in addition to sharing design ideas and brainstorming the finished product. Then, during our next consultation, I return with a finished map and we make changes until we finalize your general plan. From there, a project progression sheet is made, breaking down the entire project into a series of steps so you can have a general plan. Then, additional services can be hired out (hardscapers, architects, irrigation specialists, etc.) as needed. After this, the plant designing comes in. To-scale maps, not-to-scale maps, 2-D images, or inspirational plant lists are made as needed and most appropriate for certain areas. Sometimes, all of the needed planting plans are created initially and then installed from there. Other times, designs are made for certain areas as needed, taking breaks in between projects. In general, property scale design can include all of your aesthetic/functional design needs, such as hardscaping, small livestock, water use, and more. For example, a property-scale design may provide suggestions such as where to place a greenhouse, a pollinator garden, and a chicken coop on a property in ways that are efficient and practical. Want to take the next level in sustainability? Permaculture design expands on a property scale design, and considers many aspects in addition to aesthetics. Permaculture, in general, is considered a cohesive, nature and resource focused design of a sustainable landscape system. It focuses on sustainability, eco-consciousness, waste-reduction, balance, interaction, diversity, integration, generating a yield, and more. Here is Oregon State University’s definition of Permaculture, “Permaculture design is an ethically based, whole-systems design approach … Although rooted in horticulture and agriculture, permaculture design also touches on regional planning, ecology, animal husbandry, technology, architecture and international development.” Learn more about Permaculture and my Permaculture Design Certificate at this web address: http://open.oregonstate.edu/courses/permaculture/. Permaculture systems require a little more maintenance than the typical ornamental landscape does. However, the benefits include sustainability, and typically the generation of edibles or other yields. 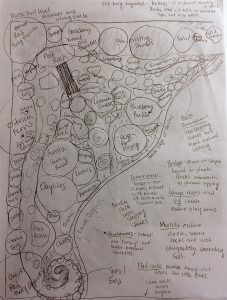 If you would like to learn more about Permaculture Design, you can read about the principals here: http://www.timberpress.com/blog/2013/02/12-principles-of-permaculture/. This list is a tool to provide suggestions for plants that can be used in a specified location. The location is typically small and specific, with a consistent environment. Lists typically contain 5-10 plant options (or another agreed upon number). These plant lists often have agreed upon themes (evergreen, berry-producing, shade-tolerant, etc.). The list includes names of plants that meet the needs of the space. A plant list is does not make a completed design. It is most helpful for someone who already has gardening experience, as additional details may need to be considered regarding plant placement. As indicated in the name, this is a quantitative list of the plants contained in a finished Landscape Design. This may serve as a shopping list for acquiring the plants needed to complete the landscape design. 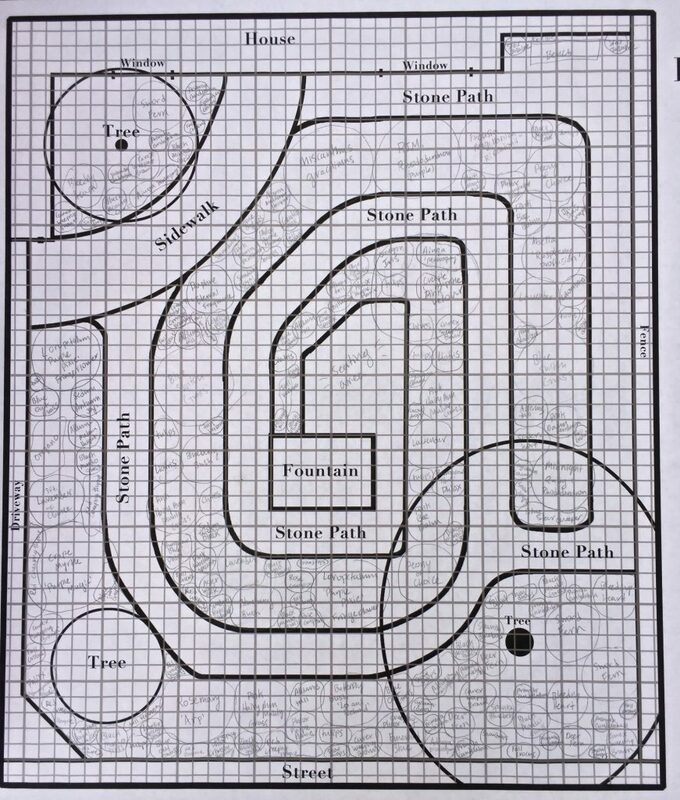 All landscape design maps come with one. 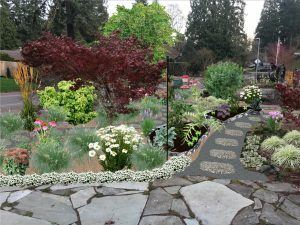 When a landscaping project seems overwhelming, this project progression suggestion list provides some guidance. The goal of this list is to break down the project into bite-sized steps, with recommendations. A list such as this can make planning easier and lessen intimidation of a landscaping project. Book lists- Recommended reading based on a theme. Other- Let me know what additional resource may assist you in your landscape ventures. (*Note that neither a disease diagnosis nor a plant identification can be 100% guaranteed. While it is a rare case that a plant cannot be identified, or that a plant affliction cannot be determined, nature is indeed capable of brewing up a wonderful foray of exceptions and vague/undeterminable case scenarios).